When was the Manchester Arena attack? On 22 May 2017 a homemade bomb was detonated as people were leaving the Ariana Grande concert at the Manchester Arena. Twenty-two people were killed and over 750 were injured. What were the spontaneous memorials? Within hours of the attack the people of Manchester began to show their respects for the dead and injured by leaving flowers, personal mementos, candles, balloons and written tributes in various locations around the city. These spontaneous memorials grew quickly, with the focus being at St Ann’s Square. Hundreds of people from Manchester, the UK and beyond came every day for nearly four weeks to reflect, mourn and leave their personal tributes. What happened to the objects left around Manchester? On 9 June 2017 different organisations in the city came together to remove the spontaneous memorial objects from locations around Manchester. Flowers were composted and some of this compost was used to plant the “trees of hope” during the first year anniversary in May 2018; plants were replanted around the city; soft toys were washed and donated to charities to be passed on to children in the UK and abroad; and candles were melt to create 22 new candles which were given to the families of the 22 people who were killed at the attack. More than 10,000 objects (such as notes, letters, cards, drawings, sculptures, toys, t-shirts) have been kept at the Manchester Art Gallery to form an archive of the public response to the Manchester Arena attack. Why is the Manchester Together archive in Manchester Art Gallery? After the Manchester Arena attack, Manchester Art Gallery, as the city’s gallery, led on the archiving and documentation of the tributes (notes, soft toys, drawings, photographs and other objects) left in St Ann’s Square and other places around Manchester. Subsequently, the Gallery prepared a storage space in its premises for these objects and has brought together key partners, such as Archives+ and the University of Manchester, to document and digitise the Manchester Together archive. The Manchester Together archive is distinct from the Gallery’s art collection. The heritage that this project focuses on is the items left at the spontaneous memorials in Manchester. It also includes oral histories and testimonies from volunteers (such as those of the Women’s Institute volunteers who washed ca2,000 soft toys removed from the memorials in the summer of 2017) and social media content. In June 2018, more than 30,000 notes that people left on the Trees of Hope trail, which was arranged to mark the first year anniversary of the attack, were added to the Archive. Collectively, this body of material, stories, experiences and actions makes up the heritage and history of the personal and collective responses to the Manchester Arena bombing. As such, the heritage will form one of the main sources and references of the event and people’s response to it and it will, inevitably, shape the process and content of personal and collective memory construction. This project is led by the Manchester Art Gallery, in collaboration with Archives+ and the University of Manchester. “Over the last year, students and staff of the University of Manchester have been privileged to work with the Manchester Art Gallery, Archives+ and other city and cultural organisations, local communities and businesses to preserve, document and store items that people left in St Ann’s Square and other spontaneous memorials around the city. How is the Manchester Together Archive being supported? The Manchester Together archive project has received a £99,700 grant from the Heritage Lottery Fund. The project will document, digitise and make available online more than 10,000 items. The money will fund two members of staff to help develop the archive. They will also recruit and train 15 volunteers to photograph every single object that was collected. The archive’s digitisation will offer people opportunities to engage with, and add meaning to, the items that have been collected. The research programme of the project has received funding from the University of Manchester and the British Academy. 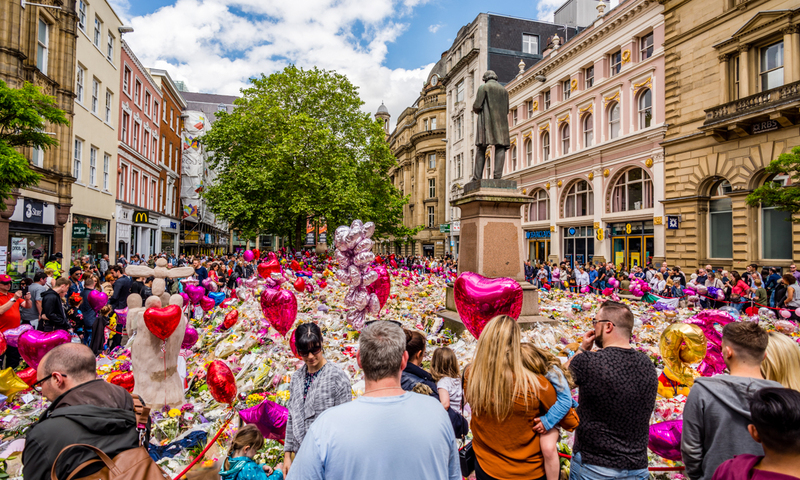 The first stage of this project (June 2018 – January 2020) will be to care for, document and digitise the 10,000 objects that form the Archive of the spontaneous public response to the Manchester Arena attack in St Ann’s Square and other places in the city. Through the digital Archive, members of the public will be able to add meaning to items of the Archive. More information about this will be released in due course. During this period of time, a Manchester Together archive collecting policy will be also developed. This will specify whether and what additional items might be considered for the (physical or digital) archive. Is a permanent memorial to the Manchester Arena attack planned? Plans for a permanent memorial are underway, with bereaved families and those most affected consulted on their thoughts about what they want a memorial to evoke. Further updates will be released in Autumn 2018. I have been affected by the Manchester Arena attack. Where can I get support? If you have been affected by the Manchester attack, you’ll be able to find help and support available to you here. This project is led by Manchester Art Gallery, in collaboration with Archives+ and The University of Manchester.